American surgeon John H. Gibbon, Jr. designed the first heart-lung machines, making open-heart surgery possible. 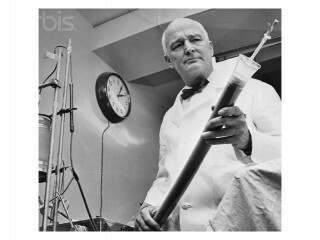 Frustrated at his inability to help patients with serious heart or lung damage, he invented the pump oxygenator, a machine capable of keeping a patient's blood circulating and oxygenated without the heart or lungs. On 10 May 1935 he showed the machine's potential by using it to maintain the cardiac and respiratory functions of a cat during surgery. Over the next eighteen years he developed a better machine with technical support from his friend, Thomas J. Watson, founder of IBM, who sent his company's technicians to work on the project under Gibbon's direction. Gibbon performed the first human heart bypass surgery on 6 May 1953, successfully repairing an atrial septal defect for 18-year-old Cecelia Bavolek, whose heart and lungs were stopped for 26 of the surgery's 45 minutes. View the full website biography of John H. Gibbon Jr..